On January 19, 2018, at 11 a.m., a male entered the RBC located at 4730 Kingsway. An indication was made that the males name was Andy and that if his instructions were not followed, people in the bank would be killed. The male then left the bank. 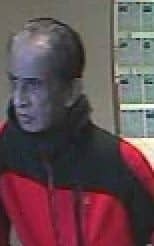 The suspect is described as a South Asian male, 65-70 years, balding, wearing a black / red rain jacket, gloves and grey track pants. If you recognize this robbery suspect, call the Burnaby RCMP. If you wish to remain anonymous, contact Crime Stoppers 1-800-222-8477 or solvecrime.ca. You could be eligible for a reward of up to $2,000 upon arrest and charge. You will never be asked your name or have to appear in court.